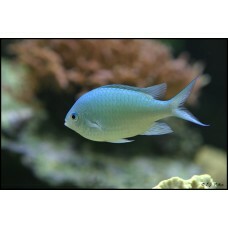 The Blue Green Reef Chromis is easy to care for, beautiful, and peaceful. In fact, Chromis viridis is one of the preferred marine reef fish amongst aquarists, regardless of their experience level. This member of the Pomacentridae family is most recognizable by its gorgeous light blue dorsal side that slowly fades into a majestic pale green belly. The Blue Green Reef Chromis is desirable not only for its beauty, but also for its peaceful demeanor (despite its designation as a true damselfish) and ability to be kept with almost all other community fish, invertebrates, and corals. Native to reefs ranging from mid-depth to shallow lagoons of the Indo-Pacific and South Pacific, wild specimens prefer to school in large shoals amongst branching corals like Acropora. In the home aquarium, the Blue Green Reef Chromis does best in similar environments and will actively swim at all levels of the aquarium water column. In fact, small schools of the Blue Green Reef Chromis add a dazzling and dramatic shimmer of beauty to almost any well-established reef system. The recommended water temperature when keeping Bicolor Chromis Damsel is 72-80° F (22-27° C), the pH-value should be kept in the 8.1-8.4 interval, and the specific gravity should be 1.020-1.025. A carbonate hardness of 8 - 12° dKH is ideal.